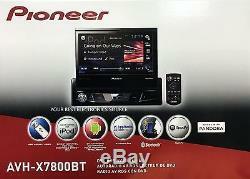 Pioneer AVH-X7800DVD In-Dash A/V Receiver. Features the responsive, powerful and intuitive NEX user interface. Dual Bluetooth connection allows for two phones to be connected simultaneously. Power Output: Peak: 50 watts x 4 channels. RMS: 22 watts x 4 channels, 5% THD. CEA2006: 14 watts x 4 channels, <1% THD. MP3 ID3 Tag Display (Title/Artist/Album). 7 Flip-out TFT Active Matrix Driving Display. On/Off Dimmer Setting & Brightness Control. Pioneer MIXTRAX creates a nonstop mix of your music library, with effects. Spotify control for iPhone/iPod via USB. Pandora control for iPhone/iPod via USB. Pioneer AppRadio One: view and control compatible iPhone and Android smartphone apps. FLAC file playback capability at up to 48 kHz/24 bit high resolution, via USB. For Android devices running operating system 4.0 or later. Connect and listen to music stored on a device, without the need for an app. Made possible by using Media Transfer Protocol (MTP). Access music via USB stored on an Android device and operate basic operations. Available Sources: Audio & AppRadioOne. Compatible with Apple iPhone 6/6+ and iOS 8+ software. IPod/iPhone with Lightning Connector requires standard USB to Apple Lightning connector. Available Sources: Audio, Pandora, and Spotify. IPod/iPhone with 30-Pin Connector requires Pioneer CD-IU201V. The Pioneer CD-IU201V will take up both the 3.5mm Input and USB Input. Available Sources: Audio, Video, Pandora, Spotify, and AppRadioOne. 24-bit Digital to Analog Converter. 3.5mm Rear A/V Auxiliary Input. 7 preset equalizer curves: S.
Bass / Powerful / Natural / Vocal / Flat / Custom 1 / Custom 2. ±12 dB Gain at 50 Hz / 80 Hz / 125 Hz / 200 Hz / 315 Hz / 500 Hz / 800 Hz / 1.25 kHz / 2 kHz / 3.15 kHz / 5 kHz / 8 kHz / 12.5 kHz. Selectable-Point High-pass Filter and Low-pass Filter. (Standard mode, see Manual for "Network Mode"). HPF: 50 Hz / 63 Hz / 80 Hz / 100 Hz / 125 Hz / 160 Hz / 200 Hz. LPF: 50 Hz / 63 Hz / 80 Hz / 100 Hz / 125 Hz / 160 Hz / 200 Hz. +10 dB to -24 dB variable gain. Selectable Crossover Slopes: -6 dB/oct, -12 dB/oct, -18 dB/oct, -24 dB/oct, OFF. Selectable Phase: Normal / Reverse. Variable Bass Boost: 0 - +12 dB. Adjustable time alignment, subwoofer control and listening position selector. 3 Sets of 4V preamp outputs (front, rear and subwoofer). Built-in Bluetooth technology for hands-free talking and audio streaming. Siri® Eyes Free for iPhone® 4s or newer. Google Voice (VR) compatible for Android Devices. Bluetooth version 3.0 +EDR certified. Wideband Speech for double sampling frequency and bandwidth. Works with most Bluetooth enabled cell phones. Includes an external wired microphone for clear, convenient, distortion-free talking. A2DP: Advanced Audio Distribution Profile allows high quality audio to be streamed from an audio device to the car stereo. AVRCP 1.5: Audio/Video Remote Control Profile supports basic remote control functions (play, pause, etc) via Bluetooth. SSP: Secure Simple Pairing, this improves the pairing experience for Bluetooth devices, while increasing the use and strength of security. SPP: Serial Port Profile provides a wireless replacement for RS-232 based serial communications. The item "NEW Pioneer AVH-X7800BT Single DIN Bluetooth DVD/CD/AM/FM Car Stereo 7 Flip-Out" is in sale since Friday, June 23, 2017.